On Friday April 4th, Alsace Master-Level Program instructor, Thierry Meyer, presented a riveting live webinar on the winds of change blowing through Alsace. Due to winegrower pressure on the production side, Alsace has moved from 3 to 53 AOCs in the blink of an eye! There are Communal and Lieux-Dit designations to complement the regional Alsace AOC plus proposals to institute a future 1st Growth AOC as well as a dedicated high-end category for Crémant d'Alsace! Understand the impetus behind the winds of change! We'll also challenge your assumptions about residual sugar as well the ageing capability of the wines of Alsace. Truly, it is a brave new world in Alsace! Thierry Meyer is an Alsace resident with a phenomenal depth of knowledge and fiery passion for the wines of Alsace! He both leads our new Alsace Master-Level Program and guides and instructs on our first Alsace Immersion Trip taking place in June 2014. In 2006, Thierry founded L’Oenothèque Alsace (www.oenoalsace.com), one of the most comprehensive modern resources dedicated to Alsace wines. At the same time, he started to promote a program of structured Alsace wine master classes and dinners, each dedicated to a specific theme and each aimed at discovering the richness and variety of Alsace wines in all categories. These sessions are open to all wine lovers, from absolute beginners to professionals, and aim to help them discover the wines of Alsace. L’Oenothèque Alsace also organizes visits to local vineyards in order to discover the unique geological complexity of Alsace. L’Oenothèque Alsace does not sell wine, and is not connected to any wine producer or association and therefore offers completely impartial advice allowing wine lovers to discover the quality and diversity of Alsace wines. From 2007 to 2011, Thierry was contributing editor for Bettane & Desseauve, the influential French wine guide. In this, he covered the Alsace region, as well as the Jura, Savoie and Bugey regions. Thierry is a member of the Confrérie Saint Etienne d’Alsace, which gives him numerous occasions to taste Alsace wines, In 2012, Thierry joined the Decanter World Wine Awards jury as Regional Chair for Alsace. Alsace possesses one of the most complex range of terroirs in all of France… and yet people’s appreciation of Alsace is often limited to its main grape varieties. Why is that? With 13 grape varieties, 200+ terroir types, and 1,000 producers crafting more than 10, 000 cuvées of dry, semi-dry, semi-sweet or sweet wines every year, Alsace is diverse, multi-faceted and a world onto itself. Moreover, quality/price ratios range from poor to exceptional. Price does not filter out the world class gems from the rest. So a typical reaction is to consider the 7 most frequently used grape varieties and decline them from dry to sweet styles, but this does a disservice to the reality of the wines at hand. The best cuvées reach the highest of quality levels. This reflects a world far different from the traditional image of the region. This is what I am planning to demonstrate with selected tasting sessions, winegrower’s visits and gastronomic experiences during our many gourmet restaurant meals. What fascinates you most about the region and its wines? When you consider the potential of the best terroirs of Alsace and the ability to produce fresh, vibrant and extremely complex wines, you realize that the best wines equal the best white wines you can produce anywhere on earth. What’s fascinating is that often the producers themselves don’t realize that they are sitting on a treasure of old vines in some of the greatest of terroirs. So it’s only a question of being knowledgeable enough to understand and spot those wines. They are always underrated and often underpriced. Above all, what is really stunning about the best Alsace wines is their capacity to get better with age. They keep very long. Anyone who had the chance to taste great wines from the 60s will be convinced that 50 years is not old for a wine from Alsace. 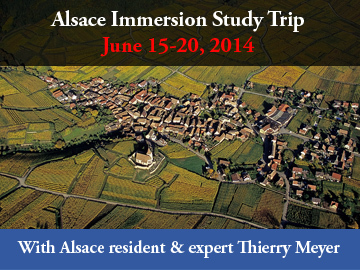 What are the main misconceptions about Alsace that you wish you will clarify on the program? Several misconceptions are still very present midst consumers and producers alike. The first misconception is to simplify balance within a two-dimensional scale of acid and sugar. Although these two dimensions are important, they do not paint a complete picture. Complexity, depth, concentration, and the nature of acidity are equally important to understand a wine’s style. The second misconception is that wines with high acidity or high sweetness will keep longer than others. Acidity may be good to preserve products, but acidity does not improve a wine. Vinegar does age well, but don’t expect it to turn into smooth wine after 10 years in the bottle. Same with sweetness. Sweetness will not prevent a wine without extract from fading away over time. There is more to a wine’s staying power than acid and sugar. Lastly, pairing wine with food is not just a question of acidity and sweetness either. It is about depth of flavor, complexity of flavor and structure also. There is a misconception that dry wines are better with food. That is not reality. People drink Coca Cola (with more than 100 grams sugar per liter) and have no problem consuming it with food. Its sweetness is close to the RS level in Sauternes or in an Alsace Selection de Grains Nobles. In very practical terms, what should a student in the program be able to enjoy and comprehend after following the program? The key to understanding Alsace--its wines, vintages, cuvées, wine styles, terroirs and its relationship with food--all boils down to the grapes and where they are grown. It’s a formula the student will master. We will address many aspects one by one, so participants can taste thee differences and make their own judgment about the styles. This knowledge base will enable him or her to purchase the wines of Alsace from a position of strength, drink more interesting bottlings and make these bottlings shine at table. A true connoisseur is not one who has the best and best-known wines in his cellar, but rather the one who knows how to serve the right wine for the right occasion, be it a complex, old Grand Cru Hengst, a young, fresh and delicate Pinot Blanc, a mature and supple red or a fresh and fruity Crémant d’Alsace. The course is both practical and empowering. 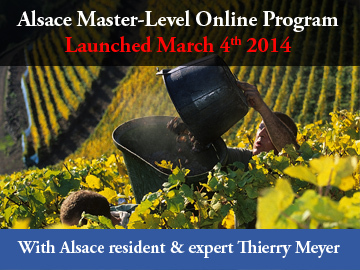 Thierry Meyer, the Parker of Alsace wines, an Alsace resident with an unbelievable knowledge and passion for Alsace wines leads our new Alsace Master-Level Program which debuted March 4th 2014. 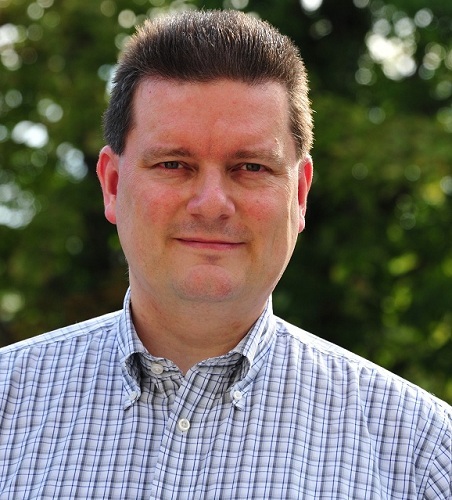 He will then lead and instruct on our first Alsace Immersion Trip taking place in June 2014. From 2007 to 2011, Thierry was contributing editor for Bettane & Desseauve, the influential French wine guide. In this, he covered the Alsace region, as well as the Jura, Savoie and Bugey regions. Thierry is a member of the Confrérie Saint Etienne d’Alsace, which gives him numerous occasions to taste Alsace wines which are up to 80 years old. In 2012, Thierry joined the Decanter World Wine Awards jury as Regional Chair for Alsace. Thierry Meyer, the Parker of Alsace wines, an Alsace resident with an unbelievable knowledge and passion for Alsace wines will lead our new Alsace Master-Level Program debuting March 4th 2014.